it's that time again to show you some of my current favorites from the interwebs and dream of how i'd pair them if only i could find a way to become independently wealthy so want would always equal have. on a somewhat related note, i'm glad to finally be dressing like a woman rather than an androgynous preteen, aren't you? 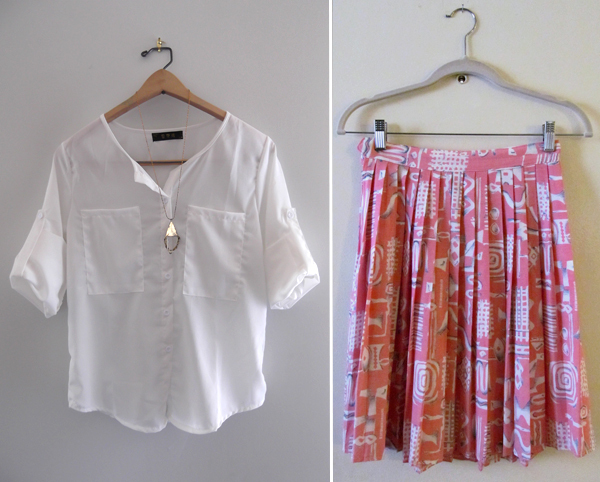 the first look includes a white chiffon blouse i already own and a pretty vintage tribal print skirt from pasadena vintage. i'd probably also pair this with ballet flats and bouncy hair and wear it seven days a week. the second look actually isn't a look, but i'd wear it to dress up a simple outfit. 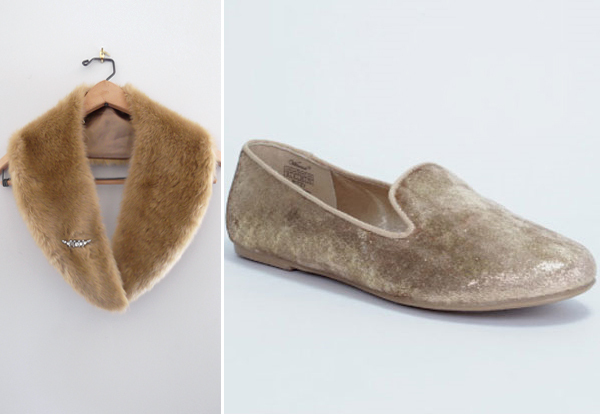 included: a vintage faux fur collar and one of my great-grandma's old rhinestone brooches, as well as (be still, my beating heart) ritzy gold flats from wanted. i'd probably wear this with skinny jeans and a striped shirt. or maybe colorful cropped pants and a cream sweater. my point is - the possibilities are endless! the third look is for when i have to dress up or want to be taken seriously (read: when i have to meet a client that may not take me seriously because of my small stature and soft voice). it's so ladylike, isn't it? 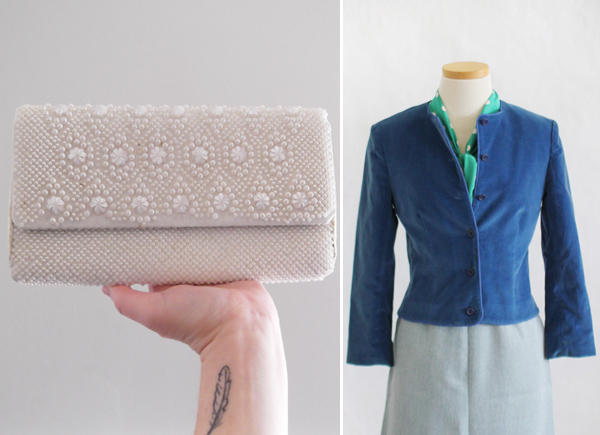 shown is a vintage beaded clutch that's sadly been collecting dust, and a gorgeous velvet blazer from fine and dandy vintage. whether i go to the rodeo, take a walk through the country, or just go to the grocery store, this outfit would make me feel lighthearted and cheerful all day - a side effect of a good novelty print. 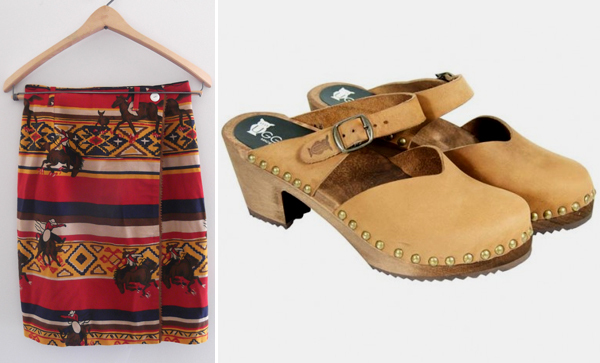 the amazing vintage rodeo print skirt is mine all mine, and the ugglebo lisbon clogs should be! Those are fun... I really, really wanted a faux fur vintage vest, but it's already January, and it will be warm here in two months. Having a major skirt deficit, and I always see cute ones in blogs and on people, but they look so awful on me. btw girl fiancee, have i told you lately how MEOW your shorter hair is? ;) love and miss you!!! I like all of these, but my favorite is by far the last one. I want something in that pattern! those clogs are pretty sweet! i finally got a pair from lotta of stockholm and just patiently waiting their arrival! oh my! great finds! especially the skirts!! i was actually dreaming of doing some thrifting today since it's 1/2off at our local salvation army. but, i had no sitter and three sick kids so i never made it out. next time! such a great idea for a post! love it! So many fun pieces! I think I still dress like an androgynous preteen, how'd you know?! loving that skirt and those clogs! too bad we can't share clothing! four jedis, i know what you mean about the vest; i've been wanting one too, but after i had my christmas money i thought, "i won't be able to wear it for too long before it will be warm again!" nicola, that's why i do outfit posts, because it encourages me to dress like a woman rather than a slob! micaela, isn't that skirt he best?! i almost passed out when i saw it! love you, fiancee! april, i wish i could just find that fabric so i could make all sorts of things from it! 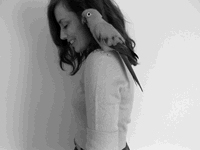 cb, i had actually just heard of lotta from stockholm the other day. i can't wait to see how you style them! yellow finch, sometimes i have thrifting plans too, but my problem is i seem to run out of time. i hope you get to go soon! maria, i know, if i lived closer to you, i'd be going through your closet all the time! Great ideas! I especially love the idea for the second look- sounds so pretty and timeless! Oh I love this post- very unique!! I love that tribal print skirt! I love the skirts, the print is just so cute! The shoes too, reminds me of See by Chloe new collection. Love ur blog =) Shall we follow each other?